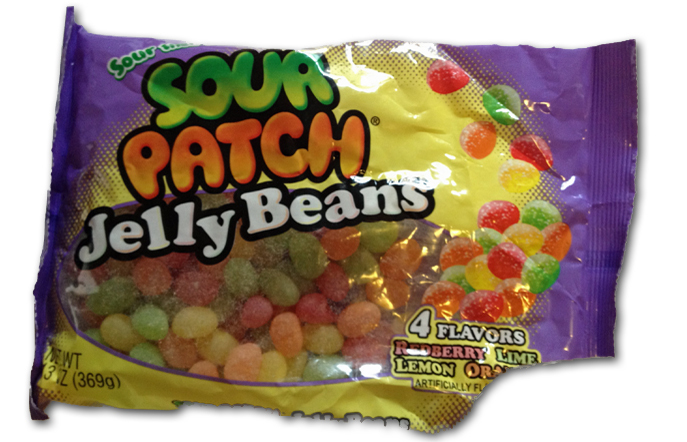 Home » 5 Freshest » Sour Patch Jelly Beans…..Waaaaaa?? We like Sour Patch Kids. Who doesn’t, they’re a delight! Sour- very sour, with a nice, sweet, sticky chewy finish. They’re probably the most accessible sour candy around, as they’re available at every movie theater, Target….even local grocery stores. I was sure it must have been a Passover themed candy. Or maybe Easter? But there’s no pastel colors anywhere, which confused me. Pastel = Easter. Green & Red = Christmas. Green = St. Patty’s Day. And so on. So…maybe these were just a new product? These are a bit different than your usual “candy company decides to release a jelly bean coz they can” bean. Usually they’re smooth. Usually they have the same 5 flavors, and are disturbingly bland. These are crusty with sour loving, and are the same flavors as the ‘kids. They’re excellent. They don’t taste exactly like original Sour Patch Kids, since…what would be the point? There’s got to be some difference between the two candies. But they’re close, and they for sure harken the original flavors, but in chewy bean form. Super crusty yummy. Also, the people don’t lie: I always bring in candy to work so as to not grossly increase my back/midsection fat. This one, more than almost any other had the kids raving. Not literally holding glow sticks and listening to Tiesto, but instead happily eating these. To the point where, once a few people tried them, they were gone in a couple days. That’s fast for my crew. Now the hard part: where to FIND these again? Target doesn’t have them, and they’re not sold in most online candy stores. Amazon has them for…almost 9 BUCKS a bag? Hells no. I found a link to buy them at PartyCity.com for under 3 bucks. Even better, swing by the store and pick them up and save on shipping. Either way, get some. They’re “delight”. And congrats to the Sour Patch team of product developers-you finally hit it right. I saw them at the DollarTree and got them to put in Easter baskets. It sounds like I should have bought a bag for myself. 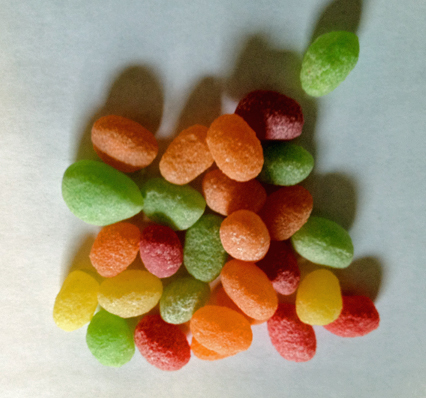 I am not 100% impressed with these babies, but they are certainly better than the sour patch watermelon, etc… I have found that there is some inconsistency in the flavors, typically associated with the jelly-bean coating part of the candy. I think there may be some quality control issues at the jelly bean factory where these are produced and occasionally, the candy coatings get mixed around between different flavors/brands. That being said, I thought I would mention here that I found them for sale 2 bags for $5 in the Easter candy isle at my local CVS. Don’t pay $9 per bag! !